Workers at six libraries in Gloucester County, N.J., now have a voice at work! 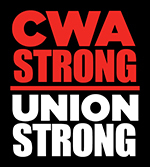 CWA Local 1085 President Mike Blaszczyk, EVP Joe Hiles, and VP and Organizing Committee Chair Brian O'Donnell supported this successful effort as part of the local's CWA STRONG program. The organizing committee developed a mission statement and shared their vision in one-on-one conversations with coworkers about the benefits of joining together to create positive change at work. Thanks to this diligent work, they won voluntary recognition from the Gloucester County Library Commission last Friday.